Jim Powell feels as if his family isn't as close as it once was. He wishes they would spend more time together and do more activities with each other and when his wife Stephanie has to leave for work and take a trip to South America he wants the whole family to go. She says that the family can go without her and Photoshop her anyway but Jim insists that they do it together as a family. They decide to take a plane to get a view of the rain forest. The plane is very small and starts to take a dive towards the water when they are caught in a surprise storm. They crash into a river in the amazon and luckily all survive the crash except the pilot. Jim hopes this experience brings them closer but when they return home it seems like nothing has changed at all. While Jim was at work, he's a sketch artist for the police, a detained criminal get's a hold of an officer's gun and starts shooting. Jim pushes a coworker down and realizes that he catches on of the bullets in his hand. He is completely stunned. Shortly after Jim realizes he has super strength, the rest of the family soon realizes that they too have powers. Stephanie can run super fast. Their Daughter Daphne can read people's thoughts and JJ their son can see the answers to any problem. Stephanie who is a scientist tells her best friend about everything that had been going on and they set out on a search for the answer as to why and how this could happen and they soon learn it had to do with something in the water they were in when their plane crashed. The whole family goes on a journey to save themselves from Stephanie's boss who not only has the hots for her but has a personal vendetta with her family after he finds out that they have powers. He too also has powers but in the end the Powell family is victorious and Jim finally gets his wish that they are closer. Joshua and Katie reconnect; George is held hostage on a plane that spirals out of control; Mrs. X kidnaps J.J. and forces him to solve an enigma. Stephanie is whisked into the future and sees the destruction of her family. Returning to the present, she tries to alter a chain of events in an effort to save her family. The Powells' lives are threatened when a super-villain with animal-like powers is assigned by Mrs. X to eliminate the family. King's mysterious superior, Mrs. X, seduces Jim and George, making them obey her every command. Meanwhile, Chris is suspicious of Daphne and her family, and Stephanie has to compromise her principles to maintain her cover as a loyal worker for Dr. King. Jim is riddled with guilt when he diverts a bullet during a fight with a thug that accidentally hits a boy. The Powells' lives are threatened when Dr. King orders shape-shifter Victoria Morrow to murder one of the family members. Stephanie asks Jim to join forces with her to help catch a friend's attacker. While Internal Affairs officer Rachel Jacobs investigates reports of a rogue cop, Jim risks revealing himself as the prime suspect when the police station is overrun by a group of thugs, and he is the only hope of survival. Meanwhile, Katie and Stephanie run into Human Resources VP Victoria Morrow and begin to suspect that she isn't who she says she is. Jim's wayward brother, Mike, makes a surprise visit to the Powell household and discovers the family has powers. But in an attempt to make some quick cash, he tries to convince JJ to using his abilities to win big by betting on the horses. Meanwhile, in a surprise twist, Katie is given a promotion at Global Tech by Human Resources VP Victoria Morrow, who may be hiding a secret agenda, and Daphne is placed on the school's peer disciplinary committee and believes a student may have been wrongly accused of possessing drugs. After Jim saves Dave Cotten's life, he and Stephanie become fast friends with Dave, his wife Michelle, and their kids. But Jim becomes suspicious that the Cottens may be leading their own secret lives. Meanwhile, Daphne decides to run for student council president, and Katie reveals a secret to Stephanie about her relationship with Joshua - aka The Watcher. After George was mistaken as the hero for stopping a robbery that Jim actually stopped, things have been awkward between the two friends. George thinks Jim is jealous of the attention he's receiving, and Jim feels that George is taking credit for something he didn't do and hogging the limelight. Jim and Stephanie have plans to celebrate their 18th wedding anniversary, but instead find themselves dealing with a serial arsonist who is exhibiting some special powers of his own. Meanwhile, Daphne and JJ are left home alone and join forces to win some big money in a poker game with some fellow students. Stephanie tries to determine why Jim has a sudden loss of powers, which could prematurely put an end to his crime fighting days; JJ may be facing criminal charges after he's caught hacking into the school computer system by his teacher; Daphne uses her abilities to impress a boy; and Katie begins falling for her mysterious new beau. George asks Jim to help him take down a mobster who has eluded captivity for years. Meanwhile, Stephanie disobeys Dr. King's wishes and tries to find out more about Volson's research. Daphne asks JJ to use his powers to help her impress a boy. When Stephanie's hard-to-please parents, Barbara and Allan Crane, pay an unexpected visit, the Powells must control the use of their powers for fear of giving away their secret. But Barbara and Allan begin to suspect that something is amiss when they witness some strange behavior. Meanwhile, when friend Trent Stafford and his parents are the victims of a home invasion, Daphne uses her abilities to help Jim try to track down the thugs responsible for the violent act. Jim goes into search mode to discover the cause of some recent earthquakes; Stephanie is suspicious of JJ's claim that he doesn't have any super powers; and Daphne struggles with morality issues when she reads the minds of a fellow student and teacher and suspects they may be having an affair. Jim is mistaken for a murderous vigilante while patrolling the park; Stephanie makes a profound discovery; Daphne uses her telepathic abilities to get into an exclusive party reserved for only the cool high school kids; and JJ tries out for the football team - with a lot of help from his power. Jim and George crash a wedding to catch the thieves who stole Stephanie's wedding ring. Meanwhile, Stephanie is forced to break into a secure lab to retrieve Katie's blood sample after the lab tech substitutes her blood for Stephanie's. JJ asks his sister to read a girl's mind and find out if she likes him. Stephanie is a research scientist and Jim is a police sketch artist who feels unfulfilled in his career. In order to organize his life and to bring his family together, Jim schedules a trip to South America for his family, including his teenage children. While there, they get into a plane crash but miraculously all are spared. After returning home, something mysterious and amazing starts happening to them. No Ordinary Family is currently available to watch free on ABC and stream on ABC. 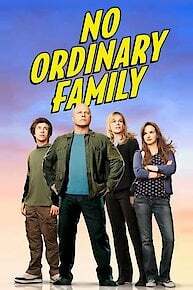 You can also stream, download, buy, rent No Ordinary Family on demand at Amazon, Vudu, Google Play, iTunes online.